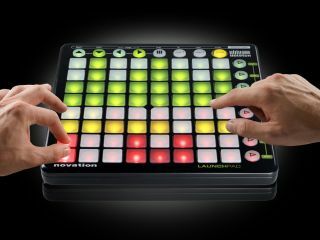 StepSeq gives the Launchpad a melodic twist. PRESS RELEASE: Novation have launched StepSeq, a free Max For Live Patch that turns Launchpad into a fully fledged melodic step sequencer. Conceived as a cool but powerful sequencer to enable Launchpad users to program melodies, leads and basslines quickly in Live, the buttons are configureddiatonically (as opposed to chromatically, as with a traditional step sequencer). The degree of the scale and its tonal centre can be set by the user, meaning that, once set up, any note you trigger in your sequence willfit in harmonically with your track, making itreally easy to keep within the context of the song. The round buttons on the right-hand side of Launchpad are used to determine which parameters the grid of square buttons will affect, enabling you to alter the velocity, pitch, and length of notes, just like on an old-school groovebox but with a few extra tricks. An additional probability function lets you set the likelihood that a note will be triggered, so you can add interesting variation to your sequences.Being a patch for Max For Live, StepSeq can be edited, so you can customise its features and use it as part of larger patches. Ableton Live 8.1 and Max For Live are both required in order for Novation's StepSeq to operate.Currently, using StepSeq and Live's CS Step Sequencer (which is ideal for drum programming) simultaneously with Launchpad, results in conflicting LED update messages. This will be resolved in forthcoming updates.